Let’s start off with a joke: what do you get when you combine a pregnant woman suffering from all-day “morning sickness,” three kids aged six, three and one, a small dog who is almost blind and a husband who works full time and is in a season of busy travel for work? Give up? You get the perfect time to do a kitchen remodel, that’s what you get! Stacy and I had been talking about remodeling the kitchen for a long while. We strategized and planned on how we could make it work. We had saved and made sure we had plenty of margin for those extra costs because simply put: we don’t do debt. Finally a break came in my travel schedule with work and it was time to get started. Here’s a run-down of the project, including timeline, cost and key learnings. We spent roughly six weeks of evenings and Saturdays plus $3,100 transforming our kitchen from an early 1980’s oak and polyurethane wonderland to its new glory. If you’ve ever remodeled your kitchen, you know that is a BARGAIN, especially considering we replaced several appliances. We did all of the work ourselves with the assistance of YouTube and some other online tutorials, as well as a little input from a couple of friends via phone calls. I’m a woodworker and have some remodeling experience, but I am not a professional builder. Heck, my college degree is in business and accounting. I sit at a desk all day and work on a computer. 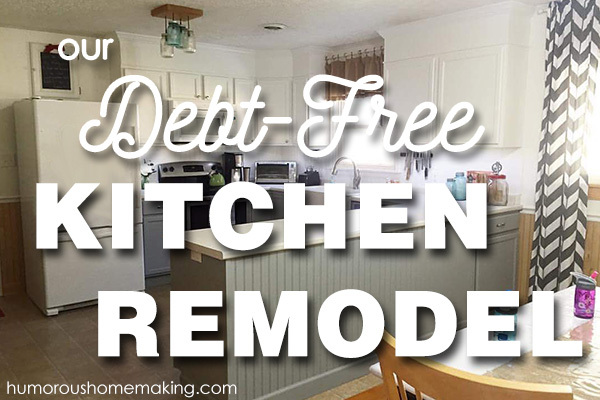 But if we can remodel our kitchen ourselves and without debt, you probably can too. First off, we did ALL the work ourselves. A good builder makes good money, and rightly so. If you factored in the cost of hiring someone to do all this work, it would have cost a lot. I estimate we put 75+ hours of work into this project. Even at a very reasonable rate for a remodeling contractor, that’s a couple of thousand dollars or more. Second, we shopped around. I called my friend Phil, who is a contractor, to ask him the cheapest place to buy my various supplies. 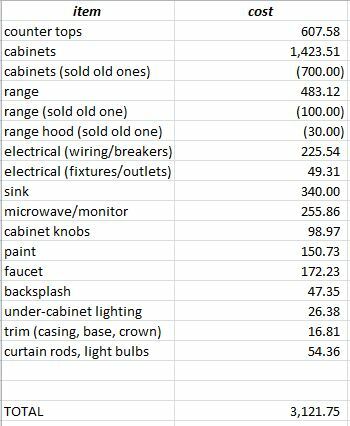 With that knowledge, I was able to save more than half on some of the supplies vs. going to Lowe’s or Home Depot: cabinets, wire, under-cabinet lighting, counter tops, trim. Third, I made a lot of the customizations from scratch instead of taking the easy way out. For instance, we wanted the cabinets finished to the ceiling. So I framed out the area above the cabinets and used thin plywood and inexpensive waist moulding and basic crown moulding to finish it out before painting. On the island, I used beadboard panels to make the finished backing for those standard cabinets instead of having to buy cabinets that looked finished front and back. For the toe kick, I just cut strips of cheap hardboard leftover from another project and painted them to match. It is stuff like this that saved us a bunch of money and put my woodworking skills to use without sacrificing quality on the finished project. Last, we didn’t stop living our “normal” lives despite the hectic space and time. Stacy used her crock pot (of course), induction burner, toaster oven, microwave and some other basic kitchen tools to feed us through the time we didn’t have a formal kitchen. We set up two folding tables and used paper products to minimize washing dishes in the basement utility sink. It wasn’t fun, but can you imagine how much it would have cost to eat out or only eat convenience foods during the remodel? In 2008, we visited our first Ikea where Stacy fell in love with the Domsjo farmhouse sink. She’s never wavered in her desire for that specific sink. None of our nearby Ikeas (okay, “nearby” is a relative term) had it in stock, but we have family in Cincinnati who were AWESOME and bought one on our behalf and hauled all 105 lbs. of its enameled beauty to us. We bought really good paint. 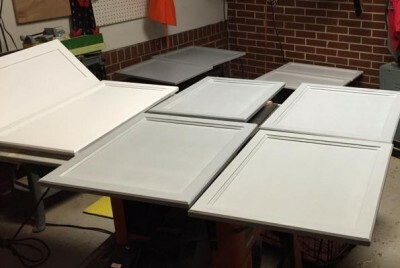 I did a ton of research online as to the best finish for painting cabinets that would hold up well over time. We ended up using Benjamin Moore Fresh Start primer ($40/gal.) and Benjamin Moore ADVANCE waterborne alkyd paint ($50/gal). I stressed a bit over this decision because the opinions are all over the place, but I can happily give my endorsement to the ADVANCE paint for three reasons: 1) it went on really easy and covered well, 2) it leveled well and dried quickly and, 3) it cured a lot faster than the other brands I’ve used in our home over the past couple of years (Sherwin Williams, Valspar, Behr, Glidden). There are more expensive paint options out there, but there are also a lot less expensive ones. Do you have any idea how boring it is to watch paint dry? Let’s just say it isn’t exciting at all. Everything got one coat of primer and at least two coats of paint. Stacy brushed on the primer coat and I used a foam roller to put on all the top coats, sanding lightly between each coat. It wasn’t hard work, but it was long, tedious and made us impatient toward the end. I hated just waiting. I had a really hard time with the base cabinets. Before this project, I had never put in kitchen cabinets. Wall cabinets were pretty easy, but our floor is so out of level and working to get the spaces for appliances correct I had a fit with the base cabinets. I spent most of a day setting base cabinets when if I had called someone with some experience, I’d have saved several hours. With the limited space available in a reasonably-sized article, I had to skip a lot of stuff. If you have any questions about our remodel project just leave a comment below and I’ll try to get more specific. Does the Benjamin Moore primer happen to hide/level wood grain on oak? We have oak cabinets and Ive been reading the grain shows through and is a bear to cover. Any paint or primer will partially fill the wood grain on any wood (including oak) to eventually make the surface smoother. There are commercial wood fillers designed specifically for filling grain or you can put a few coats of primer or paint and get the same result. That said, the Benjamin Moore primer is an EXCELLENT primer for coverage, but it is NOT super thick so it doesn’t do a great job at filling pores. For that you may want to look into a thicker primer than what I used. Zinnser makes one called “triple thick” that is touted as being really good for this, although I have not used it. What is the name of the white on your upper cabinets? We are in the middle of a kitchen remodel and I’ve been surprised at how many whites there are! We have white appliances too so it has been a bit tricky finding a white that works with them. It’s Benjamin Moore Advance. We just used the plain white base (no tinting). Really, really good info! We have a bathroom that needs to be done and although we will not be doing the work ourselves, I will be painting the vanity instead of replacing them with brand new. I also plan to utilize our local Habitat for Humanity resale store to see what they have to offer before heading out to to buy brand new. As the wife of an artisan cabinetmaker (snooty word for custom…we live in northern CO and the snootier terms the better) and furniture maker, nice job. WE HAVE A KITCHEN FROM HELL THAT NEEDS EVERYTHING. WHERE IS THE BEST PLACE TO BUY CABINETS? It completely depends on your budget and your locale. DO NOT BUY THEM FROM THE BIG BOX STORES (Lowe’s or Home Depot), as you will pay too much. Check around for builder supply houses or similar and you’ll find much better quality at the same price or the same quality as a big box store at a lower price. We bought ours from a place called Big John’s Closeouts and bought an upper level grade of builder’s cabinets. We did not go too high end because they can get VERY expensive. Absolutely beautiful renovation! I am stunned by the amount you spent on completing the project, truly amazing! 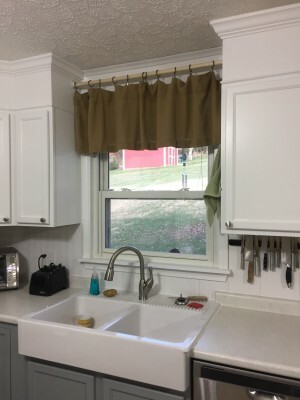 My husband and I (well, my husband) renovated our 1940s kitchen and everything was DIY. We did go with cherry butcher block countertops that were inexpensive and are extremely easy to maintain. Your kitchen look SO bright now! Love it. Care and upkeep of butcher block countertops is very easy. Mineral oil or food grade tung oil and sandpaper. That’s it. Wow, what a tremendous difference the white & gray make! So much brighter looking. I love the sink!!!! We have been wanting to remodel our small circa 1904 farmhouse kitchen for a couple of years. We didn’t want to start on it until we were finally debt free. As of January 2016 we are now totally debt free!!!! We are now in the process of saving up & patiently searching for the items we need to start remodeling. It will be a slow process for us, not much carpenter experience here! I do have an uncle that builds houses for a living so he may be on my speed dial!!! Great job on your kitchen!!! Your hard work definitely paid off. Congrats on the upcoming addition to your family! We are in the middle of a diy kitchen remodel. My husband does remodeling as a profession so I got my labor for free. 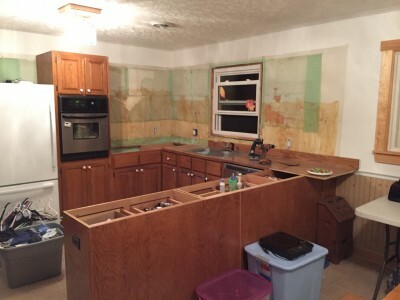 A friend gave us a heads up on some cabinets and appliances that were removed from a home in an exclusive neighborhood so we got some quite usable cabinets, 2 wall ovens, & granite tops to use on an island. We got the corner base & upper from Habitat ReStores. My husband can build the cabinets we’re missing to match & down the road we plan to use hickory flooring to make all matching doors. Many of our projects include greatly reduced clearance items like flooring & wall tile. Reused like cabinets, sinks, doors, & windows from ReStores or the discarded items from other people’s remodeling, Oops paint. And just some unconventional items like a nice Kholer utility sink for a kitchen sink (free). Like you I agree on spending your money on certain items you fall in love with (special order slate for the guest bath) & stuff like faucets, toilets (never get used, yuck), tubs, & electrical. Your kitchen looks beautiful & I really appreciate the tip on what paint you used. Good paint is an amazing thing! Just embarking on a remodel design. Starting from scratch as the kitchen is a rough 1950s build. Can you tell me the source of your cabinets? Likely not the same place up in the northeast but it will give me an idea of where to look. Did you consider IKEA cabinets? We did consider them…but we decided to go with hardwood cabinets, which we found at a local closeout store called Big Johns. I do not think they are a chain, but they might be? The cabinets we got were unfinished maple. There are plenty of good cabinet brands out there in varying costs. Here’s what I look for: cabinet sides and are made out of plywood, not particleboard. Drawer sides are made out of solid wood or plywood, not particleboard (except the drawer bottoms, which particleboard or hardboard is okay). Drawer construction is done with dovetails, not staples and glue. Face frames, cabinet door frames and drawer fronts are all solid wood and grain matches reasonably well. Doors are joined using rail/stile or mortise/tenon instead of dowels. Can I ask if this location of the cabinet store was in East TN? The place we got them is called Big John’s Closeouts. They have a location in Elizabethton, TN and another in Mountain City, TN. The kitchen looks wonderful. It’s so refreshing to see what you did wasn’t over the top like a lot of similar articles. We are DIYers ourselves and can appreciate the time and effort that went into your remodel. Great job, very inspirational. WOW! Stacy & Barry you did a beautiful job. Trying not to be jealous over here. We’ve torn down two sets of selves and debated since July 2014. Hope it looks as nice as your when we get that far. I’m sure it will! And you will LOVE them! Your kitchen is beautiful! What a great job. Love your new kitchen. It’s the same color combination we have been thinking of doing. Love the beadboard. What is the name of your grey paint? Also, what did you use for your backsplash? Hey Melanie. Thanks for the compliment! The grey is Benjamin Moore’s computer matched version of a swatch we found at Lowes called “Contemporary Grey”. We used PVC beadboard planks from Lowes for our backsplash. They worked GREAT and were easy to put in. I put them in after countertops so it really makes everything look seamless. It’s beautiful! Well done. I love that you sold your old cabinets. Our first remodel we GAVE our cabinets away on craigslist for the labor of them coming and removing them. We had so many responses that the 2nd time we offered them for $100. Still had them gone in a few minutes. I think you priced yours better for the market. It looks great! The colors really make the room look a lot bigger. 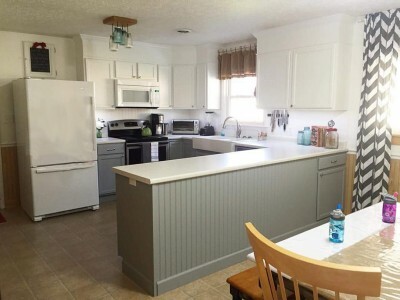 What a great remodel, and selling the old cabinets really took a chunk out of the budget. It looks terrific! Thanks, Sydney! We figured it couldn’t hurt to try to sell the old ones….and they sold SUPER fast! It looks beautiful! 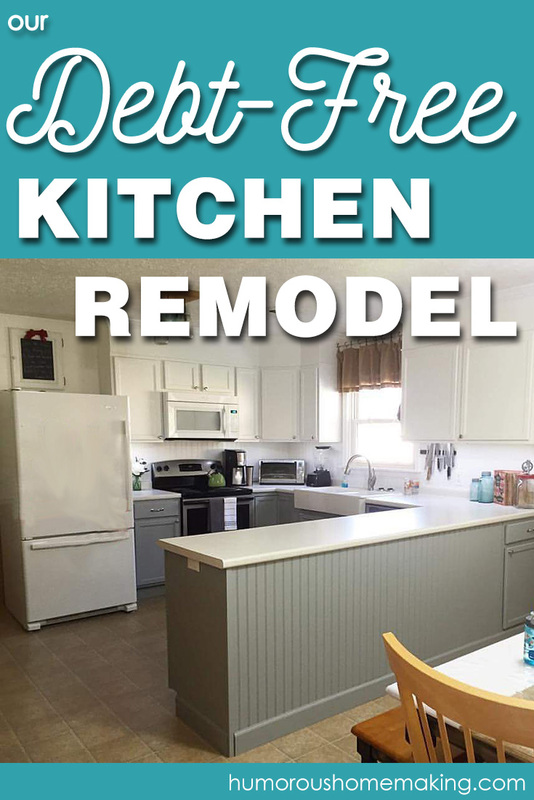 We are planning a budget kitchen remodel sometime in the next 18 months (saving up cash!) I love the white/gray cabinet combo! Your kitchen is beautiful and timeless! That is beautiful, y’all! I’m pretty sure we’d have to hire somebody to do that well. I hardly know which end of the hammer to hold. And I’m not sure I’d caught that Stacy was pregnant again. Yay! Yay! Hope you get over the sickness soon, Stacy! I’m on the home stretch now, baby! 🙂 Almost 34 weeks with #4. And no, I can’t figure out what causes it. Can you help me? Is that an outlet at the end of the counter top? Is so, where does the wiring run? Yes, that’s an outlet at the end of the island. The wiring runs up through the floor (had to drill a small hole) and inside the cabinet in a little channel behind the face frame of the cabinet (drilled a small hole in the bottom of the cabinet in the front corner where it can’t be seen. It is GFI because it is wired in after the outlet directly to the right of the sink. Did you build your own cabinets or buy ready-made but unfinished? We’re looking to do the same thing ourselves! We bought ready-made unfinished cabinets. Kitchen cabinets are not that hard to build, but they take a while and you need the space to build them. We found all the unfinished cabinets we needed that I could customize a bit here and there for probably 1.25x the amount I could have built them (material cost). So it turned out to be way cheaper to buy them.